Cousin Susan Lindsay Church provided these two letters from her great great great grandmother. It is unknown if the typos were created in the transcribing from handwritten notes to a typewritten document, or were in the original handwritten documents. My mother’s name was Anne Catherine Cassite as they use to spell it when I was young, which in French, some say, would be Cossette and others say that in France, it was called Cassa. I cannot say which is right—I know they have altered it since I was a woman, and I believe they all spell it Cossitt now—I went to Claremont (New Hampshire)* when I was 14 or 15 to school and lived with my grandmother (Anne Catherine Cole b 1752, d 1828)*. She used to amuse me of evenings telling me of her family and grandpa’s. My grandfather’s name was Ambrose Cossitt, Grandson of Ranne Cossite who came from France and was cousin to Louis Capet, King of France. He was born in Paris. His father’s name was Capet Cossete. He was first cousin to the king, his mother being a princess. His son, Ranne, after getting his French education, he was sent to Oxford, England to get an English education. When throu’he took a passage on bord a vessel for France. It was at the time of Robespiere, when he was driving off or killing the nobility and I believe they were at war with England. They would not let the vessel or any passingers land—so they came on to America—My grandmother told me that the rest of the family made their escape in one vessel and met on the oceon. I do not not remember, but the rest of the story is much like what my cousens have just written me. I suppose she may have some old written records which I never see—as she and her brother John live at the old place, or near it in Claremont, N. H. where our grandfather lived and died in 1809. The family made their escape, it seems, about the time their son wished to land, but could not. The vessels started for Canada and while on their way, the brothers from the family vessel went aboard the other to see their long absent brother and to dine with him. While at dinner a British war vessel attacked the vessel where the young men were and took all of them prisoners—while the vessel his parents and the rest of the family were on, made their escape to upper Canada—where they purchased a large estate of land, I presume a township, called a Manner in French—by the name of Kettescone. After France got at peace with itself, the family, part of them, went back to France—I don’t know whether they left more than one, but we heard of an old bachelor who lived on one half of the Mannor, while the other was left for the American heirs—we heard this years after. Ranna Cassite and his brothers (my cousin wrote as if there was more than one of them, thou’ she did not say there was) were taken to Middletown Canada as prisoners of war. As these United States was provinces of Great briton then, they, with other prisoners of war were taken to New Haven and were permitted to go at large on parole, that they would not go out of New Haven until exchanged. When the war was over, they were all exchanged, and the brothers all went to Canada, except Ranna Cossite—who had folen in love with a Miss Ruth Porter, a daughter of an Episcapol Clergyman. Her parents were unwilling she should leave the Provence and the marriage was consumated on condition that he would not take her out of the then colonies and he gave his bond to that effect—so he lost nobility, wealth, relitives and country all for Ruth—never to behold country and kindred again. He purchased land in Linsburg Can. But now called Granby—near Salmon Brook—which name is very familiar to me from my grandma’s tale. I have a paper copied from a history of the family by Frederic H. Cossett, which gives the names of several children as belonging to Ranna—but which I think must be a mistake—and that the names of Francois (Fransway) Timothy, John, Alexander, Molly, Ruth must all be Ranna Cosite senior’s children and brothers and sisters of Ranna, Jr. For my grandma in talking of them, called them Aunt Lydia, Aunt Holcass. I do not remember for certain that my grandfather’s fathers name was Ranna, but I think it was. He lived in Grandby—I think, on the original farm bought by his grandfather, Ranna Cosite who was born in Paris France. About the year 1690, and died in Granby Can. about 1770 so Frederic H. says. But he does not make Ranna Jun. as old as my grandma used to tell my mother, too, used to tell me, how my grandfather’s father, when in his ninetieth year, got on a horse back and rode up to New Hampshire to see his son and back—It must be a hundred and fifty or 2 hundred miles, and that he died in his 96th year. Ranna Cossit Jun. had some daughters and four sons, Ranna, Ambrose, Asa and Silas. I think Silas went West, I believe, to Ohio, when the country was very new. Ranna was educated at New Haven College and was ordained at London, England, as a Episcapol Clergyman about the close of the Revolutionary war, I see by a Centenial sermon, delivered in Claremont, N. H. which my cousen sent me, that he was there before 1773, when he and my grandfather Cole with many other Episcapols were imprisioned because they would not take either side. They were kept in close confinement a while, then guarded and watched until 1779—though the Rev. K, Cass was allowed to preach. I think he married in C—had 5 or 6 children, when in 1785, he left this Church and was appointed missionary at Sidney Cape Breton, where he remained until his death in 1815. His oldest son, he sent back to go throu’ collage at Hanover, N. Hampshire, he followed, but I do not know what business he followed, but I think his second son, Benjamin was a lawyer. Rev. came back to see his cousens in Claremont in 1818 and fetched my aunt Mary, who was then unmarried, and aunt Ruth Stevvens up to Canada to see my mother. A few months ago I was at a large party and was introduced to a Mr. Forbes from St. John. As we were talking about the country, I observed that I had cousens in Sidney, by the name of Cossitt. He had been there several times and had business with a lawyer by that name—but he is so I suppose Cousen “B” has gone the way of all the earth. My grandfather Ambrose Cossitt and his brother, younger, Asa Cossitt married sisters, Anne Catharine and Mary—then called Polly Cole—daughters of Samuel Cole Esq. of Claremont, formerly from Farmington, Can. He was of English descent and nearly allyed to the Stewarts and Mary, the unfortunate Queen of Scots. He had been highly educated and had studied Theology—but owing to circumstances over which he had not controll, he could not go to England to be ordained—he was sent by the Episcapol missionary Society as lay reader, and teacher in the then wilderness of N. Haven, where the Church in Claremont had been started by a few Episcopalians. He married a young widow by the name of Dean in his young days, by whom he had two daughters. My grandma and Asa Cossite’ wife. Asa went back and lived and died on the old Cossitt farm in Grandby Can. Mrs. Dean, my grandma, (she died when my grandma was born) had 2 or 3 daughters by her first husband. The oldest of which was 6 or 8 years old was raised in N.York by some relitives. She, I think, had 2 husbands, the last of whose name was Croker, or Crosket—I do not know which. She had but one child, a daughter by her first husband. She married a French gentleman by the name of Prolle—their oldest son, Rev. Thadens or Theopholis Prole, was a prominent and much celebrated Christian Episcopal Minister in York Stat—I believe noa a great ways from New York City. I never saw any of them but have heard my aunt Mary Cossitt and Uncle Fransway, who visited them, speak highly of them—and once when aunt came from N. Carolina, their oldest daughter Eveline came to Claremont and spent the summer with her. My grand father Ambrose Coset Esq. married Anne Catharine Cole, for whom I was named. They had 7 children who lived to be men and women. My dear mother, Anne Katherine, Mary Alma, Elizabeth Ruth, Ambrose Cosette Esq., Samuel Cole Cossitt, Fransway Ranna Cossitt, Charlotte Rosan Cossitt. My mother, A. Katharine married my father, John Ayers Perkins and afterwards Ezra Misick. She lived here in Ill. with me nearly 14 years and died at the ripe age of 90 years—lacking 7 days. 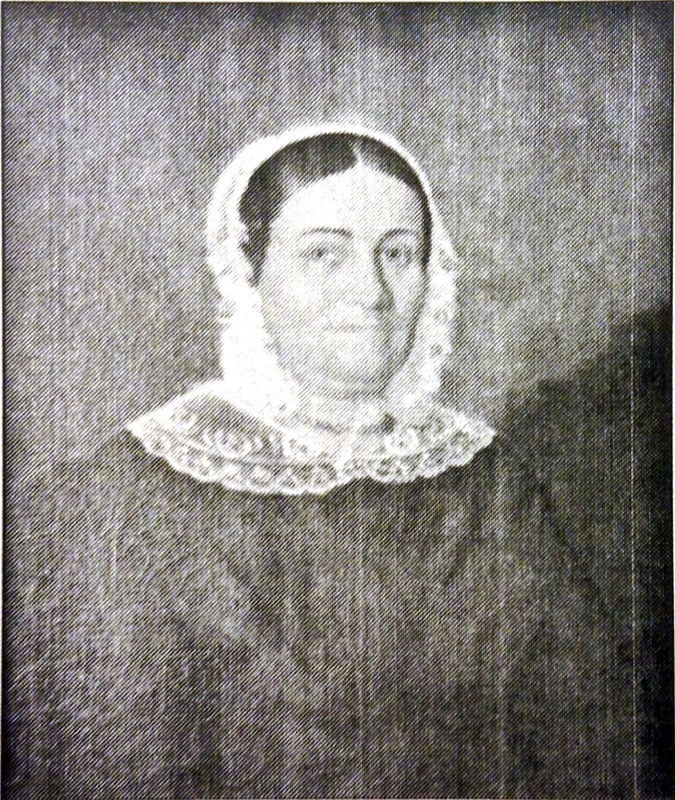 Mary A. Cossitt, the second child, lived single till she was nearly 40 years old and then married Joshua Jewett Esq. of Grandby, Can. and was his third wife. She had 3 sons, one of whom died young. The youngest is Judge Patrick Henry Jewett of Jeffersonville, Indiana. The oldest, Henry Lee Jewett of Macon Georgia, merchant. I was married and came directly to Ohio and though I loved my aunt Mary dearly, I never saw her after she was married—Nor have I seen either of her sons, though I have held some correspondence with them both. My aunt died in Granby, Can.—some where about the time my mother died, perhaps a little after. Aunt Ruth married Mr. Bliss Stebbens and lived many years in Vermont—Williamstown, where my dear husband was raised and where I first became acquainted with him. Aunt Stebbens raised 5 children. And after Uncle S. died, she married Col. Simon Wright of Williamstown. She out lived him and died at Adrian Mmich at son’s F.K. Stebbens—At the age of 87. My grandfather’s oldest son, Right Hon. Ambrose Cossitt lived near the old place, (which he owned and his youngest son, John occupied) in Claremont where he died several years ago. His oldest son George was a banker in Littleton, N. H. I do not know whether he is alive or not. Samuel C. Cossitt died in Ohio some years ago—I believe he has some sons living, but I do not know where. His daughter, Elizabeth, married Dr. John E. Dalton and lives at Onalaska near La Cross, Wisconsin. Fransway Ranna Cossitt, the youngest son of my grandfather had a Collage education and studied for the ministry of the Episcopal Church—After being in North Carolina two or three years teaching an Academy, he went to Kentucky and was President of the Princeton Colage many years. He said he joined the Cumberland Prebytrerians because he thought he could do more good there than in the Episcopal Church. While there, he married a Miss Blair, by whom, he had a family of children—but the wife and all the children are now dead, except one, Lucinda, which, I believe,was her mother’s name. While in Kentucky, he married a Miss Matilda Edwards. Her brother was governor of Ill. and she had brothers living at Springfield and Alton. When he withdrew from Princeton Collage, he removed to Tennessee and was Proffesor in an industrial Collage at Lebanon and also edited a religious paper for several years—He died there some time during the rebellion. His daughter married a lawyer by the name of Edward Golloday and he has a granddaughter living in Lebanon, who married Mr.Golloday’s nephew. Charlotte R. Cossiott, the youngest of my mother’s family was only 3 years older than myself and I loved her like an older sister and looked up to her as the hight of perfection. After attending the academy in New Jersey, she went with her brother F. to North Carolina and taught in the Academy with her brother. She became acquainted with a Mr. Jacob Voohees from New Jersey and came back to her mother’s in Claremont and was married, I think in 1819. I saw her then, but not her husband, for my mother came for me and I had to go home before the marriage was consummated. They moved to Tennessee, but in about 3 years she died in the town of Charlotte, Ten. She and her brother Franceway are the only two children of my grandfather’s of which there was 7, who died in the same State and they nearly 50 years apart. I never see my cousin Lucinda Golladay, but I still hold a correspondence with her for her father’s sake. Also with Aunt Ruth’s son Cortland B. Stebbens of Lansing, I am acquainted with him and his brother, F.R. Stebbens, of Adrian. I also correspond with Uncle Samuel’s daughter and husband, Dr. Dalton—I believe her sister, Lucinda Turner, of Doway, is dead. When Ranna Cossitt, my grandfather’s brother, went to Cape Briton, he went to Upper Canada horseback—and through there to Sidney—as there was no other way of travel then. He stoped at some town not many miles from Betiscone, and registered his name in the hotel where he spent the night. When he returned, he stoped at the same hotel and the landlord told him the day after he was there, an old gentleman, a bachelor, by the name of Cossite, who lived on a large Manor a few miles from there—saw his name on the register, and found where he was going and followed him two days—but could not over take him to see him. But he had been gone so long from his family, he did not go. Several years after the family got my father who was in that country to go and look about it. He found one half had been occupied and cultivated. The other wild timberland with several families called a squatters, as they did not own the land and made a scant living by cutting down the timber and making salts. When I was at McDonough County, about 5 years ago, my brother’s only child—daughter-Ann Lauderman, told me she had heard, I do not know how, that her Uncle Solomon Steele had gone up there and claimed to be an heir to the estate and was getting large rentage from it—but I could not believe it, for he would have to get evidence to sware that he was a heir to the Cossite’s estate—which would be a positive lie—as he is only a brother of Henry B. Perkins wife. Henry B’s mother and my mother was Anne Katharine Cossite’s only the third generation from Ranna Cossite, who came from France. My brother did talk of going up there and seeing about the Bettescone Estate, but owning to his ill treatment of that same brother-in-law, did not go. His brother-in-law sued him for property, which his parents had given to their daughter, Hannah (my brother’s wife) many years before—the officer met him, I think, at Montpelier while on his journey to this country the last time. Fortunately, he had friends there who loned him the money, he had sold his properties in Canada and did not get the pay till another year. My niece said her uncle, she believed, would take a false oath any time if he could get money for it, and she believed, could get a plenty of his brother Odfellows to swere to it. My dear brother had never told me of the trouble he had on his journey—as I suppose he felt ashamed to expose his brother-in-law meaness. My dear and only brother was a Christian—and a Episcopalian and rejoiced through his long, long distressing last sickness in his faith in Christ and through his grace, hoped for a happy immorality. He died some 4 years or more before my dear mother, who died in 1869. I believe I can think of nothing more now—and will sign my name. I thought I had written all I could of the Cossitt family, but last January in opening a box of old letters, I found the fly leaf of an Old Testament printed in Cambridge, England in 1770, and on the blank side was the marriage of my grandfather, Ambrose Cossite and Ann Catherine Cole in the Church on Sunday Feb 1st, 1778 by Rev. McViets—just one hundred years ago. Below it the births and Christening of their children—My mother was the oldest and if living, would lack only one year last May of being one hundred years old—She died at the age of ninety. I will put this leaf in this book and hope no one will destroy it. I cannot say whether it is written by my grandmother or Grandfather, but I think by the latter and must now be one hundred years old. I hope it will be read by their posterity of the six and seventh generations. I found old papers almost worn out, that gave the directions for going to Smithfield Trimble County, Ohio—which was then called New Connecticut and signed by Epaphroditus Cossit, Ohio, and on the back signed by Silas Cossitt, Vern, Ohio. I remember seeing Epaphroditus at Clairmont, when a child going to school there, but do not know how near a relative he was, but suppose he must have been first cousin to my mother—and Silas Cossitt her uncle. I will put a letter in this book written by my cousin, Miss Emma Cositt—also a little part of a history taken from Frederick H. Cossitt of N. York—who once, I believe, lived in Memphis, ten. But in his record of the ages of the 2 first Ranna Cossitt, he does not make either as old as My Grandfather’s father was. I have often heard my grandma and my mother tell how he rode on horseback from Granby Can. To Claramont, N. Hampshire at the age, or in his 90th year and lived till he was 96 years old. And my grandfather was raised on the old farm that the first Ranna Cossitt—the son of the Duke of Cosett, who was the first that came to America had bought. And my grandfather Ambrose Cossitt must have been his son, or grandson. Copyright © 2011, 2014 Cossitt Family Association Inc. All Rights Reserved.